Rosé + Burgers? You Got That Right. If you've been breathing lately, you know that rosé is so hot right now. Well, we prefer it chilled, but you get what we're saying. Burgers and beer have always had a healthy marriage, but burgers and rosé? That's a summer fling we're hot for. The love affair ignited when we added a new wine to our list: Francis Ford Coppola's Sofia Rosé. She's feminine and stylish, with a fragrant perfume of fresh strawberries and lavender. This dry rosé is crisp, delicate, and elegantly fruity with just a kiss of spice on the finish. With the #pinkdrinks flowing, the romance continued into the kitchen where Sofia met her match made in burger heaven: The Sophie. A 1/2 lb. 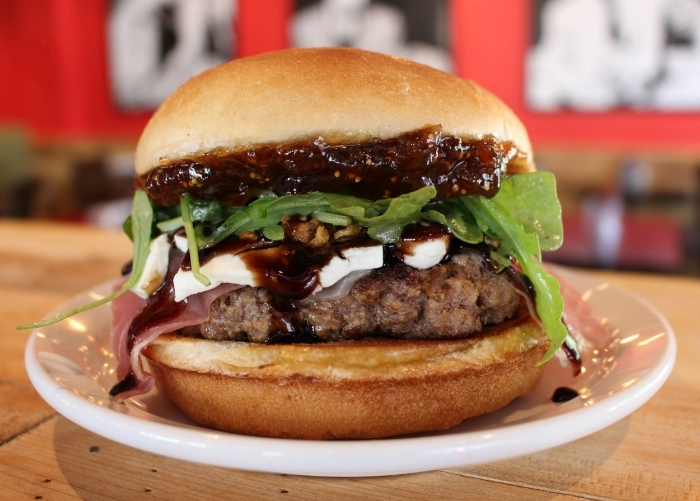 of beef with prosciutto, goat cheese, candied walnuts, Dalmatia fig spread, arugula tossed in a lemon vinaigrette, and balsamic reduction. Sofia might sound girly, but this rosé is full-bodied enough to stand up to the protein and cut through the fat to enhance the salty, savory flavors of The Sophie. This fling just got serious. For more gossip, have you heard we're launching Burgabox? Soon enough you'll be able to make The Sophie at home with our badass meal subscription service. Stay tuned, and until then CHEERS!